“This Cafe is Taking Quality and Local Love to the Next Level” originally appeared on The Town Dish. By Emily Kovach. Every neighborhood deserves a café where neighbors can meet, coffee can be savored or picked up to go, and pastries and snacks help keep the laptop warriors fueled up. But, it’s all too common in many communities that the only options are big chains, which are often impersonal, with questionable ingredient sourcing and a focus on getting customers in and out, rather than focusing on customer service. Luckily, folks who live in the Kimberton, Malvern and Collegeville areas have a local café that is the opposite of a cookie-cutter chain coffee shop: the Café at Kimberton Whole Foods. Tucked inside each of these natural food markets is an amazing, community-oriented place to stop for coffee, juices, smoothies, nutritious snacks and so much more! With a steadfast commitment to quality, local sourcing and clean and delicious food, KWF’s Café is known to locals as the best option around for breakfast meetings, lunch dates, quick bites and special treats. Plenty of cafés offer smoothies and juices, but not all are worth drinking. For starters, so many so-called “healthy” cafes use produce grown with harmful pesticides and petroleum-based fertilizers, and so many places (more than you know) substitute purees and powdered mixes for fresh fruit. Another big trend that we’ve seen is juice on draft, which may look cool, but actually compromises the nutritional potency of the juice. 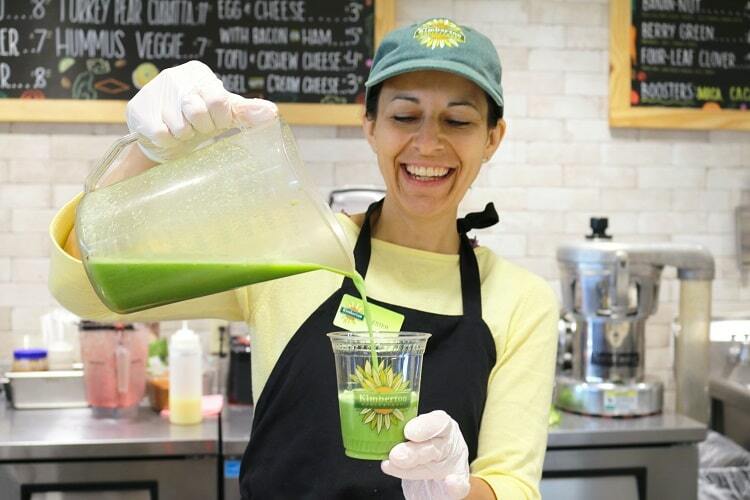 At KWF’s Cafés, the juices are always fresh-pressed to order, delivering optimal nutrition. Want to double down on the nutritional benefits of your juice or smoothie order? Try a wheatgrass shot on the side for a concentrated dose of nutrients, like iron, calcium, magnesium, amino acids, chlorophyll and vitamins A, C and E. A spicy, zippy ginger juice shot comes along with myriad reported benefits, such as improved digestion, relief from congestion and colds and help controlling high blood pressure. Or, add a “healthy booster”: goji, maca, hemp, chia and/or cacao — you know, all those awesome superfoods you wish you had in your at-home pantry! Sometimes, you’re in the mood for a deluxe coffee drink, perhaps an iced mocha, a lavender iced latte or a vanilla cappuccino. 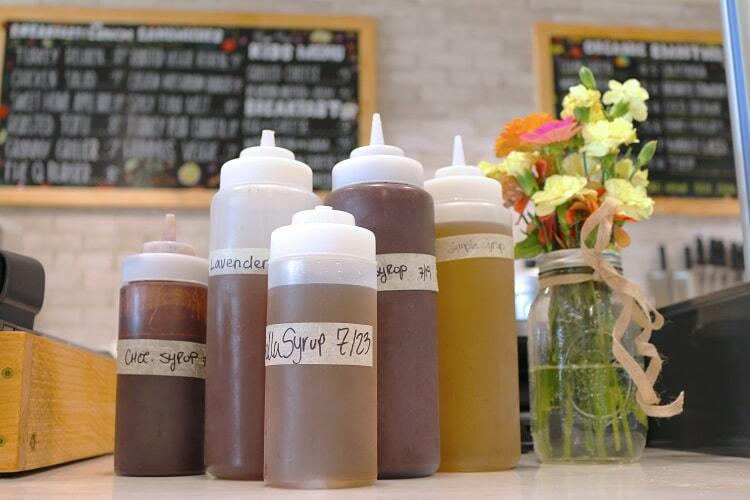 Unlike so many other coffee shops, the Café at Kimberton Whole Foods uses only whole ingredients in its house-made syrups. No synthetic flavors or preservatives here! 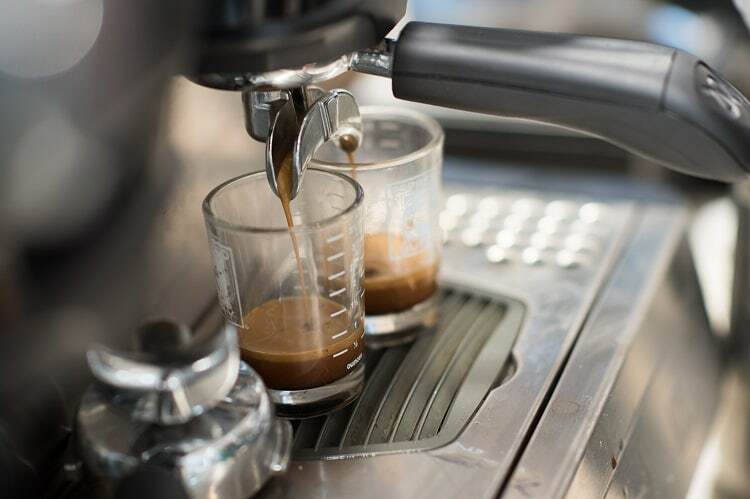 The difference really comes through in the vibrancy of the flavors — rich and robust, the perfect blend with the locally roasted espresso on offer. Plus, you can feel good knowing that those flavors are made with wholesome, responsibly sourced ingredients, like Fair Trade chocolate that is made from scratch instead of poured from a pre-packaged bottle that’s been gathering dust on a shelf. The KWF Café also offers interesting, creative drinks, like the golden milk latte (turmeric, cinnamon, ginger, cardamom and black pepper with steamed almond and coconut milk) and the matcha chai with matcha green tea, warm chai spices and steamed milk. Avoiding dairy? No problem! Soy, almond and coconut milk are also available. Keeping with the ethos of the whole store, the Café at Kimberton Whole Foods is all about keeping it local. Of course, coffee isn’t grown locally, but there are some great local companies that roast the beans, and the one you’ll find in KWF’s coffee drinks is from Hobo Ed’s, an independent, family-owned business from Adamstown, Pa. The smooth, creamy nitro cold brew coffee on tap comes from Backyard Beans Coffee Co. in Lansdale. The matcha green tea comes from Pureblend, a homegrown company started by Kari Dandrea, based in Downingtown. The flavorful, delicious chai tea is from Chaikhana Chai from Malvern, and is made with organic tea leaves, fresh organic ginger, chai spices, vanilla beans and organic wildflower honey, brewed in a small batches. Singing Dog Vanilla is the source of the vanilla extracts used in KWF’s scratch-made syrups: incredibly high-quality and pure, with vanilla beans sourced using Fair Trade Plus practices, where Singing Dog’s farmers are paid market prices for their vanilla bean pods and also share in the profits of the company. Singing Dog is headquartered in Eugene, Oregon but also has a location in Phoenixville, Pennsylvania. Locally-brewed Baba’s Brew kombucha is available on-tap, to sip in-store or by the growler to-go. 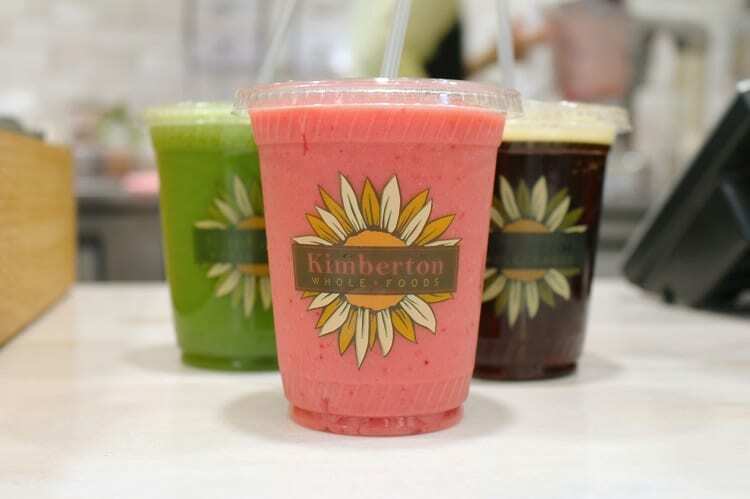 No big-chain coffee shop can compare with all of the ways that Kimberton Whole Foods strives to make only the best drinks and food from the freshest, highest-quality and tastiest ingredients it can source. Stop by the Café (only at the Kimberton, Collegeville and Malvern locations) to explore the menu and find your new go-to coffee drink! Kimberton Whole Foods has six locations: Collegeville, (484) 971-6055; Kimberton, (610) 935-1444; Downingtown, (610) 873-8225; Malvern, (484) 324-2800; Douglassville, (610) 385-1588; and Ottsville, (610) 847-2419. This entry was posted in Cafe Page, Local Story and tagged cafe, Coffee, juice, Kombucha, latte, Local, smoothies, tea. Bookmark the permalink.